Freshly roasted by order. Delicious 100% Simalungun Arabica available now. Contact info@lisaandleosorganic.com or DM on Instagram to place your order. Prices quoted do not include shipping charges. Fragrance: Floral Notes, Apricots. Honey Roasted Sweet Nuts. Flavors of Delicate fruit and floral layers with honey and vanilla notes. Mild Acidity and Creamy Body’ Juicy lingering sweetness upon cooling. Elegantly Balanced and Clean. Fragrance: Sweet Vanilla Yoghurt Flavors of Delicate caramel with honey and vanilla notes. Mild Acidity and Creamy Body; Clean, Juicy lingering aftertaste. Elegant, Balanced, Clean. Fragrance & Aroma: Cherry and Dark fruits and Dark Chocolate. 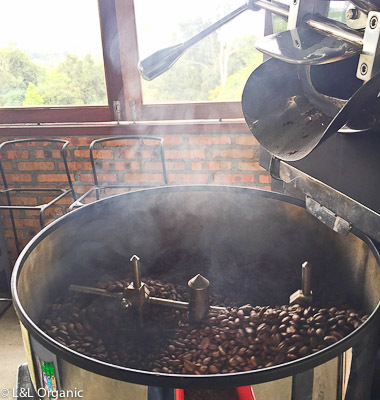 Flavors of Cherry, Strawberry, Dark Chocolate notes, Juicy Acidity and Full Creamy Body. Balanced and Clean. Fragrance & Aroma: Strawberry and Vanilla. Flavors of Berry, Brown Sugar and Honey notes, Juicy Acidity and Tea like Body. Balanced and Clean. Fragrance & Aroma: Dried or Candied Fruit and Chocolate, Fruity Sweet; dark berry like. Flavors of Dried Fruit, Cherry and Chocolate notes, Juicy, Plum like upon cooling. Mild yet Bright Acidity and Pleasant tactile Full Body. Balanced and Clean. A Dry Natural process coffee from two varietals grown organically on our farm, Onan Ganjang and Sigarar Utang. Blended together these varietals create a medley worthy of the siamang’s serenade we enjoy at the farm.